Back pain arises from disease or injury to the Disc, muscles, bones, joints or nerves of the spine. Vertebral discs are the spinal column’s shock absorbers. 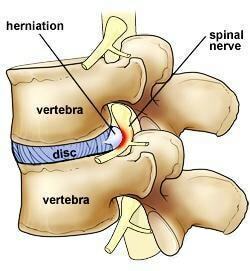 The discs cushion the vertebral bones and allow the spine to twist and bend. Vertebral discs are composed of two main parts, a soft inner nucleus (nucleus pulposus) and a tough, fibrous outer wall (annulus fibrosis). Vertebral discs can be damaged by the normal wear of aging or by traumatic injury. Problems often begin when fibers in the outer wall crack and weaken. Radial tears form in and around sensitive nerve fibers in the disc wall. The disc’s soft nucleus pushes through to the outer edge of the disc wall. This causes local back pain at the disc level. As the herniation pushes out of the disc wall, disc material may press against the large nerve roots. This can result in pain radiating down one or both limbs. Damage to bones or joints causes vertebrae to slip forward and distort the spinal cord. 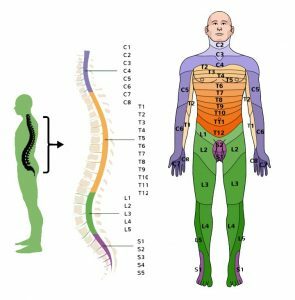 Nerve roots may become pinched, causing pain to radiate to the legs and feet. This occurs due to wear and tear in old age, also due to inflammatory pathology in young people.